Author Pam Houston (Cowboys Are My Weakness) will read from her newest memoir, Deep Creek (W.W. Norton, 2019). At Old Harbor Books, we believe that often, a good book needs a good accompaniment. Maybe that's a softly scented candle bringing warmth to your reading nook, or a slightly salty chocolate bar to nibble while you turn pages. Whichever you prefer, we've got you covered! And if you're looking for the perfect gift for that special someone, we have a multitude of items to please every personality, including games, comics, tote bags, and nerdy, science-based thing-a-ma-jigs! We're excited to honor our vintage 1895 Chandler & Price printing press! Thanks to local artist Norm Campbell, we now have our very own artwork depicting the press, which we've put on tote bags, coffee mugs, and t-shirts! Click HERE to see the full drawing. And click on SHOP NOW to get the goods! We accept all major credit cards and paypal. 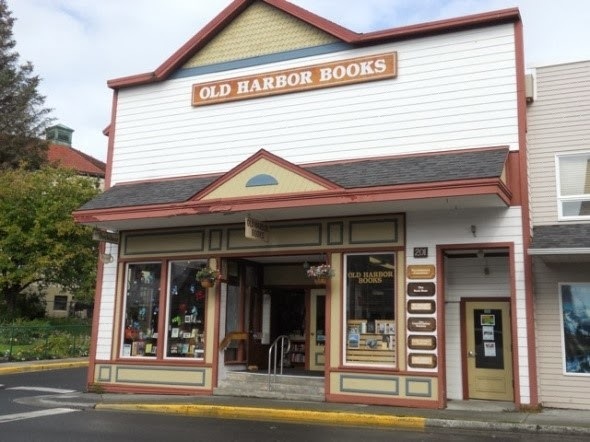 Old Harbor Books was established in 1976 by a group of three book-loving local families. Today, the bookstore is just down the street from its original location, and directed by most of the same folk. We're happy to serve you! Contact us via phone, email, or facebook with your book requests. Title not in stock? We will order it for you, with free shipping and no extra charges!